We are located in the Lake Nipigon Watershed. Our whole area is peppered with hundreds of spring-fed lakes, streams and ponds and all eventually flowing into Lake Nipigon. All these streams and lakes are stuffed with Brook Trout, Lake Trout and Splake. 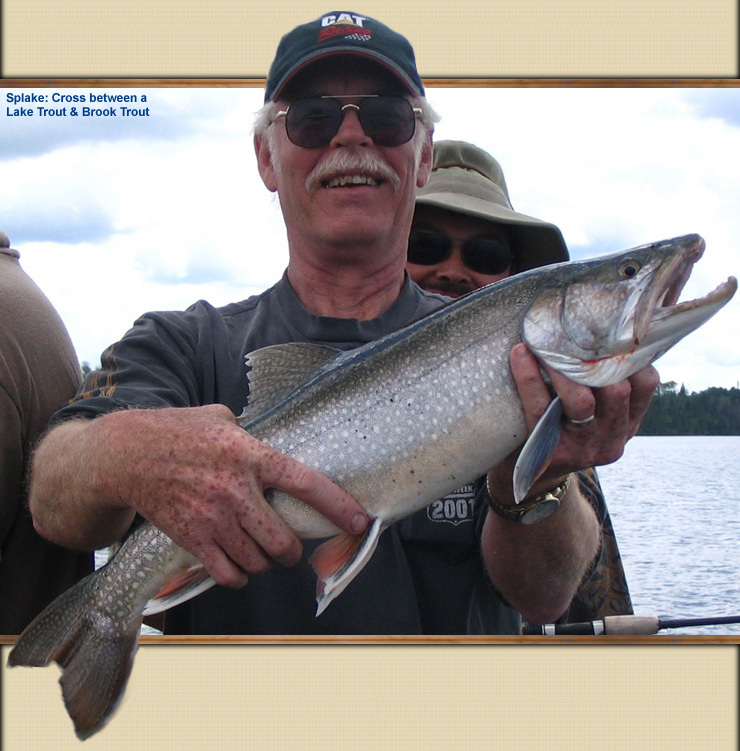 The Pasha Lake region is one of the top destinations for trout fishing fanatics in Ontario and world famous for being the home of the world record Brook Trout caught by Dr. Cook in 1915. Brook Trout can be caught in many of the local lakes and streams but the best lakes are in the chart below. Brook Trout come in many different sizes. They are most common in the 10 to 16-inch range but bigger Brookies in the 3 to 6-pound range get taken throughout the year. There have been Brook Trout caught up to 8 pounds but they are rare at that size on the smaller inland lakes. 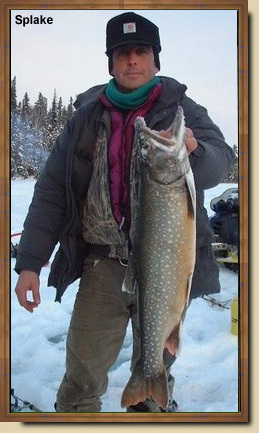 Our guests, while fishing on Lake Nipigon, usually take the gigantic Trophy Brook Trout. Any experienced Brook Trout fisherperson will tell you it’s very hard to predict how many brook Trout you can catch in a day. They are very sensitive to atmospheric pressure and changes in weather. When the weather has been high pressure and stable for a few days, guests have been known to catch 10 to 30 good size trout in a day. If a low-pressure system is moving in the Brook Trout can stop feeding for days. Save the nice sunny days for Brookie fishing. This is not always true. In the heat of the summer, small micro-storms commonly float by and drop cold rain on the warm surface water of the lakes. Brook Trout have been known to come right up to the surface and go into a feeding frenzy during these conditions. The reason they do this is because the rain attracts minnows to the surface. 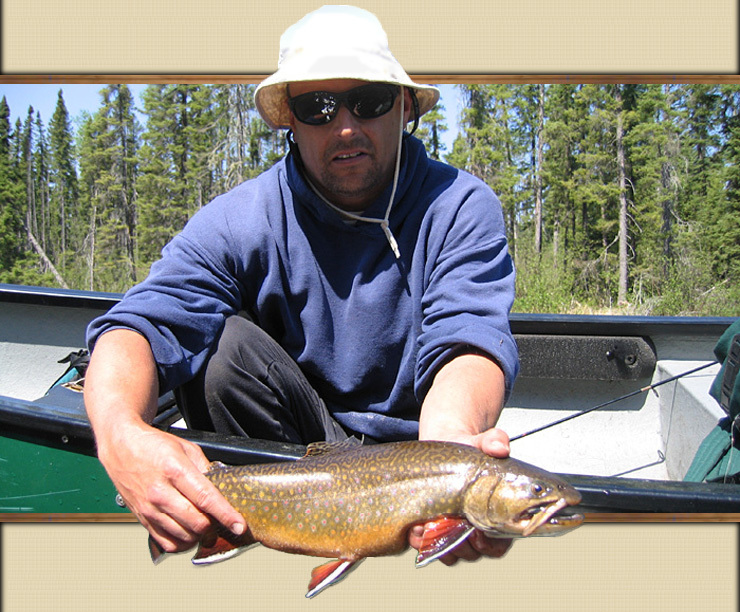 Brook Trout are a challenge to catch in any scenario and many people have only encountered frustration while hunting for Brook Trout but that is not an issue at Pasha Lake Cabins. 2013 Show #6: Nippigon Brookies from 411 Productions on Vimeo. Below is a chart showing our Brook Trout lakes. Lake Trout have so much negative folklore associated with them and people that have never caught one create most of this folklore. The three biggest misconceptions are that you have to use steel wire line to catch them, they don’t fight well and they do not taste good. In actual fact, you only need light action Walleye equipment and Lake Trout fight like hell, especially when you catch them in shallow water in the spring. Lake Trout are also the best tasting trout in the world. They taste very mild and don’t have that scunky salmon flavor that Rainbow Trout have. The same can be said about Brook Trout as well. Mind you, Brook Trout in Northern Ontario have dark Indian-red meat with a very unique flavor that cannot be described. Lake Trout are actually a species of char and they can get big. The Ontario Record is over 63 pounds and was a world record for 48 years until being beaten just a few years ago. Like Brook Trout, they like sunny days with high pressure. Lake Trout tend to go much deeper in the heat of the summer in many lakes but you will find in our small spring-fed lakes the trout are shallower because the water stays cool all year. 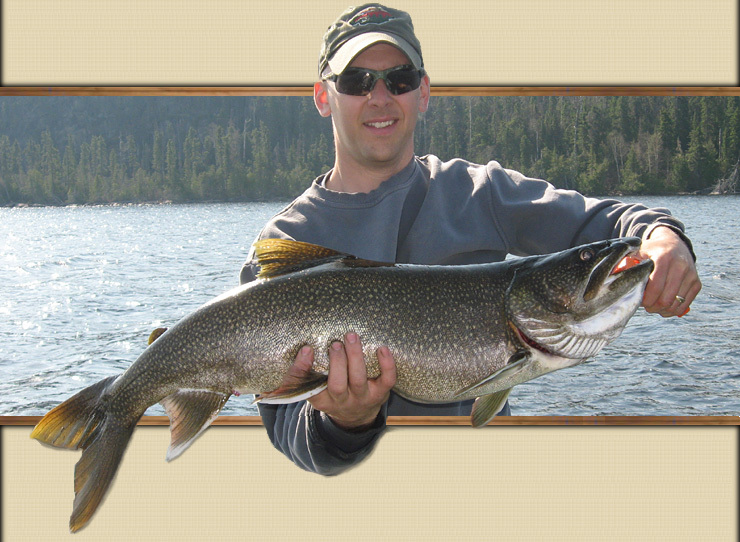 Lake Trout are common in the 2 to 10-pound range and on the inland lakes guests have caught Lake Trout over 25 pounds. Lake Trout are also available in good numbers. Guests have reported catching 30 keepers in a day. Even though you will catch lots of small ones, bigger trout usually take about an hour of fishing to get. In the spring you can just cast or troll with Cleos or other smaller lures on the surface. In the heat of the summer, the Lakers are down deeper and can be taken easily with our 3-way-swivel tips. If you want to catch a Lake Trout in the 25 to 40-pound range, you will have the best chance on Lake Nipigon but you will not see the numbers that you will see on the smaller lakes. Please read our Lake Nipigon Lake Trout page. Below is a chart showing our best Lake Trout lakes. Splake is a cross between a Lake Trout and a Brook Trout. They were artificially bred and stocked into the Great Lakes but occur naturally in the small inland lakes in our area. Splake are rare in most areas but very common and easy to catch all year round at Pasha Lake Cabins. You catch Splake the same way you catch Lake Trout or Brook Trout. Splake get bigger than Brookies and average between 4 and 8 pounds but bigger Splake close to 15 pounds have been caught by our guests. When it comes to keeping Splake, a Splake is part of your Brook Trout limit and also limited in conjunction with Lake Trout. You can keep 5 trout whether they are Brookies or Splake or mixed but a maximum of 2 Lake Trout. We are investigating to see if the Splake to the right is an Ontario Record. The present record is 20.71 pounds.